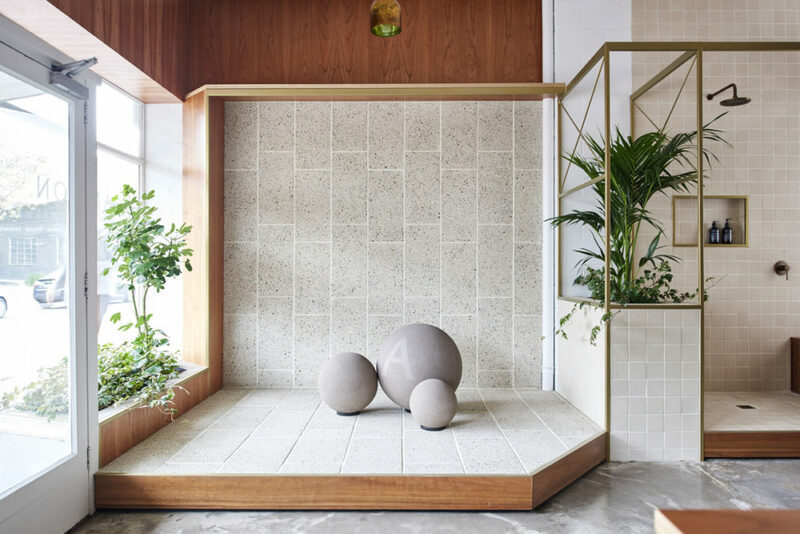 Anston Architectural makes bespoke concrete products for designers of exterior space, and the company leased a retail space in the eclectic, industrious and now desirable inner Melbourne suburb of Abbotsford. Dan Gayfer Design was approached to design an interior that showcased their premium product. A series of small yet habitable spaces have been designed, each displaying Anston’s product in both typical and unexpected applications. Customers can enter each realistic setting, experiencing the product from within a dining terrace, outdoor shower booth or entertaining lounge. 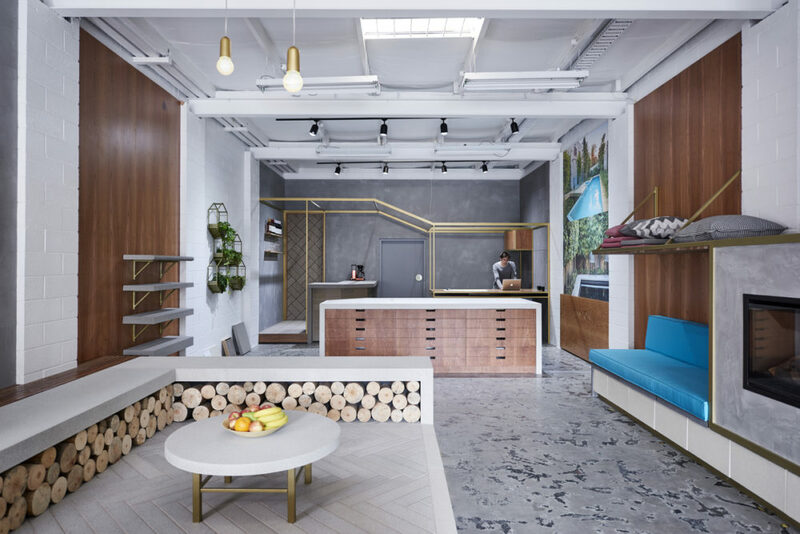 Closer to the rear of the showroom an interior flavour takes hold; a wine bar, communal workstation and even bar stools all employ the product in a surprising yet logical manner. Rather than having to visualise the suitability of Anston products, the customer can physically interact with it inside realistic everyday settings. With a clear risk of compromising the product for sale, a diverse palette of other materials was employed and not always subtlety. Conceptually, the design isn’t afraid of other materials competing or ‘partnering’ with Anston products, so to speak. Rather, and as long they were selected and applied with the utmost of consideration, they are aimed to only enhance the experience of the concrete elements. Ultimately, these carefully selected materials ‘offset’ the bold and minimalist characteristics of the concrete with the aim to enhance customer experience, as opposed to nullifying it with repetition of one material. Timber features prominently in the interior in the form of an American cherry timber veneered plywood and spotted gum battens. 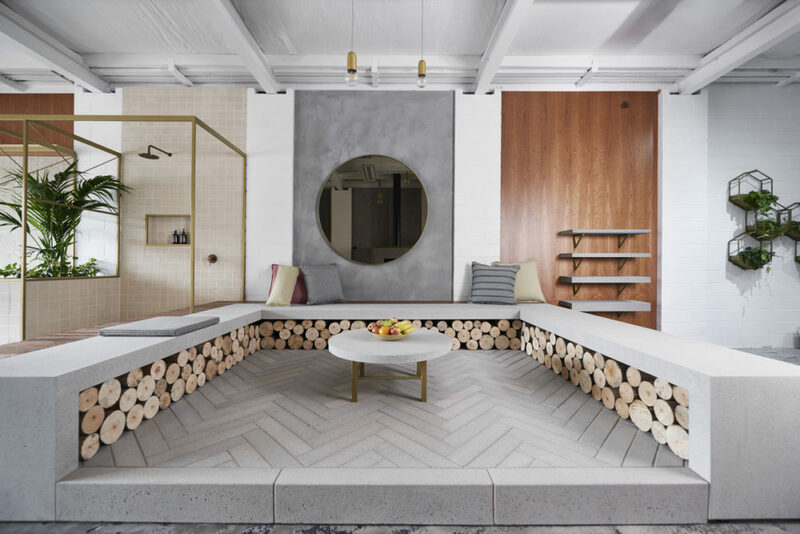 The veneer is present in wall lining, shelving and the workstation table while a spotted gum bench is a focal point intersecting the shower booth and entertaining terrace. The timber’s unmistaken warmth and natural character are the perfect foil for the concrete and breathe life into the each of the settings created. The other major player in regards to materials is tubular steel painted ‘antique gold’, a metallic colour from Porters Paints. The steel is prominent in the diverse range of bespoke furniture designed and constructed for the showroom, its flexibility as a construction material utilised to create an outdoor dining table, planters, a suspended workstation and a shower booth. The metallic finish introduces yet another finish and texture into the design, furthering this concept of diversity over repetition. The steel also plays an important role in that it has been used to define or more so ‘outline’ each setting in the design through skeletal applications such as framework, overhead canopies, borders and step edges. In some cases, the steel runs from one setting to the next, ensuring a seamless transition from one to the next. Have a look at last week’s DesignWall: Craig Tan Architects’ Roji Salon.